This open plan kitchen was designed as part of an extension to a Victorian house in West London. Vogue Kitchens was briefed to create a cooking and preparation space with an island that included an informal breakfast bar area that seamlessly flowed to a fashionable extended dining area. This included bespoke bench seating for entertaining, designed by Vogue Kitchens and made by Leicht. Leicht cabinetry includes lacquered silk matt tall and base units in Mohair colourway with a laminate wood contrast in Noyer colourway. The worktop and end panel is a composite in Veined Michelangelo, while the preparation area includes a Blanco sink and Quooker Boiling Water Tap. 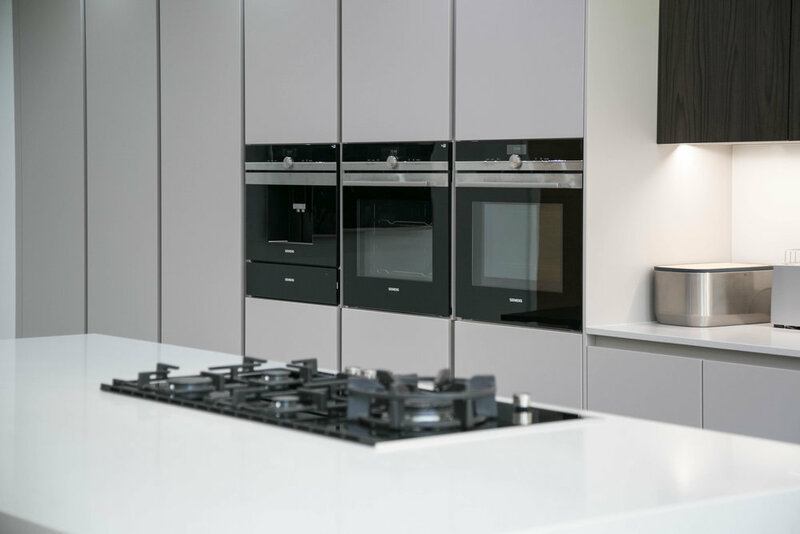 Cooking appliances are all by Siemens, with cooling by Liebherr and ceiling extractor by Air Uno.